As part of the Embarcadero RAD Studio XE3 bonus pack, TMS is proud to contribute our popular TMS Grid for FireMonkey for this limited time promotion. The TMS Grid for FireMonkey is part of a larger collection of FireMonkey components from TMS called the TMS Pack for FireMonkey.The TMS Grid for FireMonkey is a full-featured grid component that fully integrates with FireMonkey, respects FireMonkey design principles, and support IDE designer features, like the new Visual LiveBindings Designer. 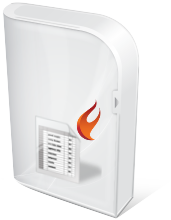 This paper discusses the motivation and requirements of a FireMonkey grid component from TMS. Additionally, this paper describes some of the basic functionality of this component. 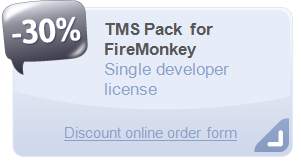 Finally, this paper includes information about and a discount offer for the full TMS Pack for FireMonkey. As soon as Delphi XE2 with the new FireMonkey framework was released, a feature-rich and high performance grid was one of the most requested components for this new framework. While we had already delivered a grid for the VCL framework for over 15 years now, it immediately became clear that first of all, there was not a quick way to port this VCL grid to the FireMonkey framework and secondly, that is was also highly undesirable to do simply attempt a direct port. We were convinced that a TMS grid for FireMonkey only made sense as a long term project in that it was rebuilt from the ground up designed in the spirit and according to the principles of the FireMonkey framework - being style-able and fully cross platform a fundamental requirement. As a component developer, the FireMonkey framework is different from the VCL framework, so the TMS team first wet its feet with the development of several more lightweight FireMonkey components. Only after we felt sufficiently experienced and understoodthe inner workings of the FireMonkey framework, we started the architecting of a new grid. A solid house is built on strong foundations. Being fully cross platform: the grid had to work well on Windows 32bit, 64bit, Mac OS-X, iOS and possibly also Android & Linux in the future. This means relying solely on the FireMonkey framework and only when strictly needed provide wrappers for OS specific functions to offer the same functionality across all platforms. Fully respect the principles of the FireMonkey framework, thus being style-able. The different visual elements of the grid need not only to be editable in the IDE style editor to modify fill, font, strokes, … but also offer the flexibility of full customization through modifying the style template. High performance: we wanted a grid that can display 500,000 rows and 10,000 columns without any significant performance hit. This is perhaps the most difficult requirement when designing something with the FireMonkey framework, especially when deploying to iOS. Weeks were spent researching the right architecture with the right balance between performance and customizability. Familiarity with VCL TAdvStringGrid: The VCL TAdvStringGrid has a history of over 15 years by now. This means that many of its features were developed over time. Through all these years, keeping backwards compatibility was a top priority and that led here and there to suboptimal organization of properties, events and method interfaces. Interface compatibility with TAdvStringGrid was, as such, not a goal of the TMS Grid for FireMonkey. The grid is designed partly in the spirit of TAdvStringGrid so that users will be quickly familiar with it but interface organization was cleaned up to make it more intuitive for new users or users with no experience with the VCL TAdvStringGrid. 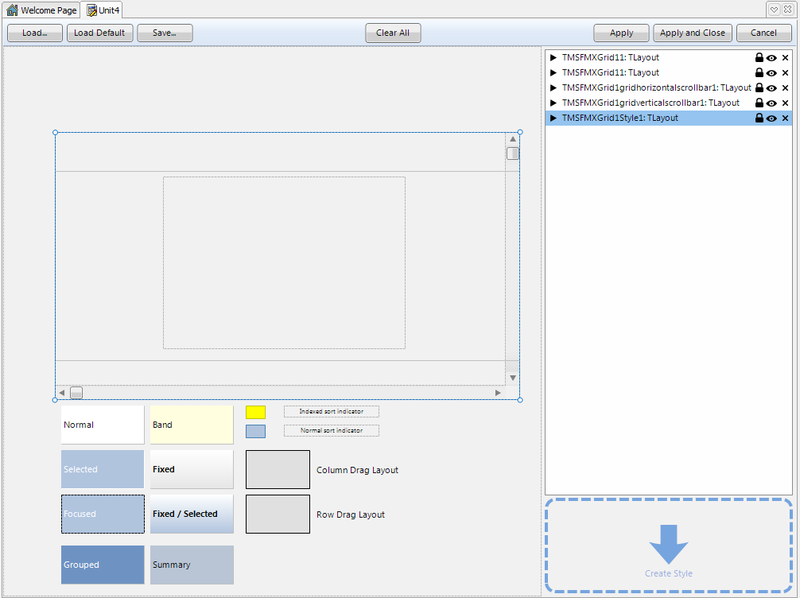 Work with LiveBindings and in particular the Visual LiveBindings Designer in XE3. The grid consists of a data layer and a UI layer. The data layer takes care of memory management, organization, manipulations like sorting, grouping, filtering of cell data, i.e. cell content and cell properties. The UI layer handles the display of FireMonkey objects that represent the grid and takes care of dealing with all mouse & keyboard events. In its basic layout, a grid is a matrix of cells with mainly fixed cells (not editable) and normal cells. The base cell FireMonkey object is TTMSFMXGridCell. A fixed cell will not scroll along with normal cells and thus remain visible on any of the 4 sides of the grid. This number of fixed rows and/or columns on the 4 sides of the grid is controlled by properties: grid.FixedRows, grid.FixedColumns, grid.FixedFooterRows, grid.FixedRightColumns. 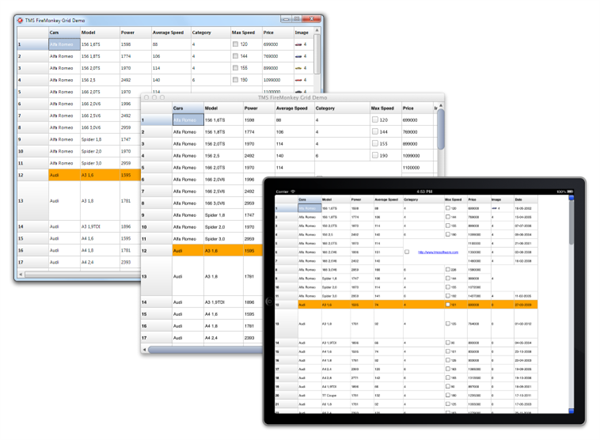 In addition to fixed, non-scrolling rows and/or columns, the grid can also perform column freezing. These are columns or rows of normal cells that will not scroll along with the other columns or rows in the grid. The number of freeze columns and rows is set with grid.FreezeColumns, grid.FreezeRows. The grid features several selection modes: single cell selection, single row selection, single column selection, cell range selection, row range selection, column range selection, disjunct row selection, disjunct cell selection and disjunct column selection. The scroll position in the grid can be programmatically set or retrieved via the properties grid.LeftCol: integer, grid.TopRow: integer. Note that scrolling in the grid can be performed in two ways: cell scrolling and pixel level scrolling. In cell scrolling mode, the minimum quantity of a scroll is an entire column or row, in pixel scrolling mode, scrolling is per pixel and can thus be done on sub cell level. The size of columns & rows is controlled by grid.ColumnWidths[ColumnIndex], grid.RowHeights[RowIndex] and it can be configured that the user can resize columns or rows at runtime with: grid.Options.ColumnSizing,grid.Options.FixedColumnSizing, grid.Options.RowSizing, grid.Options.FixedRowSizing. The grid is able to import data from different file formats as well as export it to different formats. 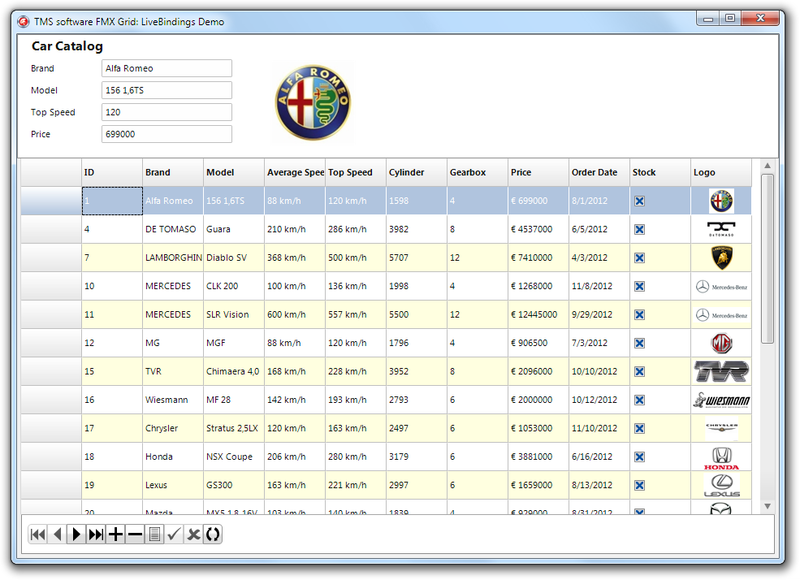 The top left cell from where the loading of data starts is set with grid.IOOffset: TPoint. Typically this is set to the first normal cell in the grid, i.e. The component TTMSFMXGridExcelIO is offered that allows to import and export to Microsoft .XLS file format. The component TTMSFMXGridRTFIO is offered that allows to export the grid to RTF file format. grid.SaveToXML() performs an export of the data in XML format. The grid has built-in sorting capabilities as well as filtering capabilities. Sorting can be performed from the UI by clicking the column header to perform a sort on a column and can be done programmatically as well. For single column sort, the sort is based on just a single column clicked. Clicking a new column will perform the sort on the new column clicked. In multi column sort mode, additional columns can be used as sort criteria by performing a shift-click on the column header. When the grid is grouped, the equivalent sorting capabilities are available but limited to groups, i.e. rows are sorted within groups rather than within the full grid. 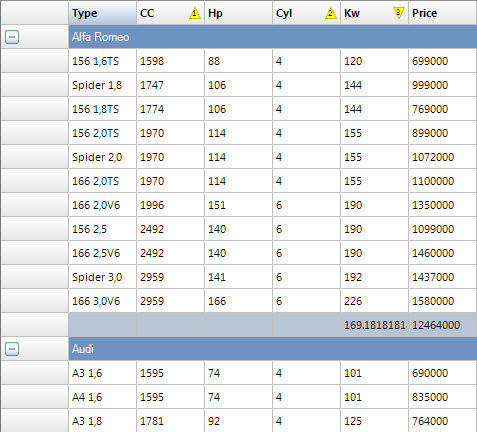 Note that to control sorting from the UI, the events OnCanSortColumn, OnColumnSorted events are available. This code snippet specifies a checkbox (a specific grid adapted checkbox that can have a background color) for column 3 and a button for column 4. Note that using OnGetCellClass means that the grid itself will be responsible for the creation of the cell control. It is equally possible to insert any type of control in a cell that was created outside the grid via the event OnGetCellControl. The TTMSFMXGridEditorType defines many types of already built-in editor types in the grid. This includes different kind of editors for string, numeric, float, hex type, a spin editor, date picker, color picker, combobox, trackbar and dial. When using the OnGetCellEditorType, normally nothing else is required to handle editing. If in addition validation is needed, the event OnCellEditValidateData can be implemented. This event is triggered when editing is about to stop. It passes the new edited value together with an Allow parameter. To map the cell content to the custom inplace editor and vice versa, the events OnCellEditGetData, OnCellEditSetData can be used. Even though we’re living in the digital age, for a lot of people, data only exists when it is on paper. The grid being the primary tool of data presentation and organization features as such also a printing capability. 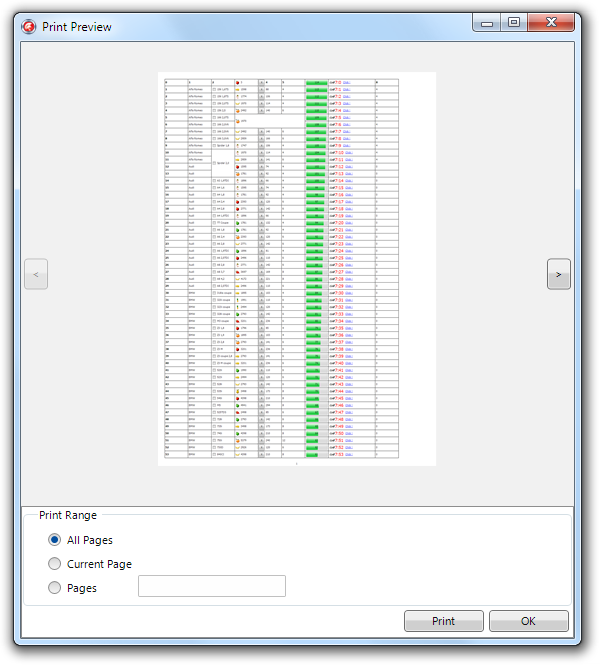 The full grid or a range of cells can be printed. Printing is as easy as calling grid.Print but many more equivalent methods are available like: grid.PrintPageSelection(), grid.PrintPageFromTo() and many more to limit nr. of cells to print, limit nr. of pages etc.. As a helper, there is also a print preview dialog component: TTMSFMXPrintPreviewDialog that is simple in its use. Assign a grid to the TMSFMXPrintPreviewDialog.Grid property and call its Execute method. Finally, the print output can also be rendered to an image file or a memory bitmap canvas. The method grid.PrintPageToImage(FileName:string) can generate .BMP, .PNG, .GIF and .JPG files. The file format simply depends on the extension of the filename specified. The grid fully supports LiveBindings to display, navigate in and edit datasets. In XE3, the easiest way to do this is via Visual LiveBindings. To get started, drop a TTMSFMXGrid on the form and a dataset. 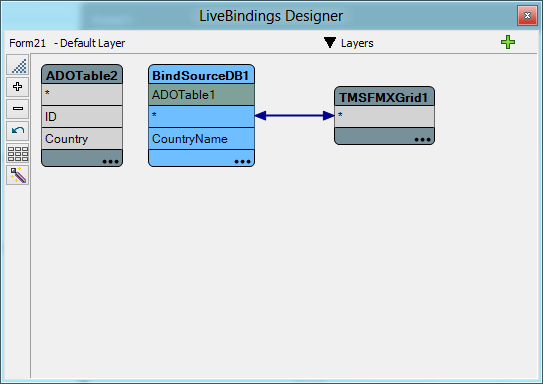 Right-click on the form and select “Bind Visually” to start the Visual LiveBindings editor. Either connect the fields you want to have in the grid from the dataset to the grid or connect the ‘*’ item from the dataset to the ‘*’ item from the grid. This way, the grid will display all fields. The grid will automatically display Boolean fields as checkboxes, graphic or blob fields as images and memo fields as memo text in cells when possible. It will also by default select a numeric edit control as inplace editor for numeric fields, a datepicker for date fields or a memo for memo fields. You can override this at any time though by implementing the OnGetEditorType event. This is Visual LiveBindings with the TMS grid in its most straightforward form. Of course you can also use the grid in more complex binding expression setup scenarios. In the full grid documentation, it is covered, for example, how you can setup the grid and LiveBindings to have a combobox lookup inplace editor. It is also possible to automatically insert or remove records in the dataset from a bound grid when grid.Options.Keyboard.DeleteKeyHandling = dkhDeleteRow or grid.Options.Keyboard.InsertKeyHandling = dkhInsertRowAfter. In this article, we have tried to give a background on the requirements and decisions that were made in the creation of the TMS Grid for FireMonkey and give an overview of its capabilities. Each topic covered in this overview article can be elaborated in much more detail and depth unveiling the power of the grid. Please see the TMS Grid for FireMonkey developers guide for this.